A modern marvel, this meticulously renovated 1869 Greenwich Village townhouse incorporates unique contemporary design elements with the finest systems, finishes and technologies. Its chic, minimalist feel is enhanced by a wonderful play of light on each floor of this approximately 9000sqft home. A floating sculptural glass-and-steel staircase that wraps around the silent pneumatic granite elevator invites natural light from the roof garden and skylight throughout the whole interior. The light-filled floor-to-ceiling glass atrium draws you into a large entertaining space served by a sleek kitchen with black granite counters, a Verde Serpentina island and premium appliance package (Viking Professional 8-burner range with dual ovens and infrared broiler, dual SMEG 36" wide single-shelf dishwashers, and Liebherr double refrigerator with ice machine). With 5 bedrooms, 5 full spa-like baths, 3 powder rooms, 6 gas fireplaces and 4 outdoor spaces including a large outdoor garden patio and private roof deck, 6 West 9 Street is as luxurious as it is comfortable. 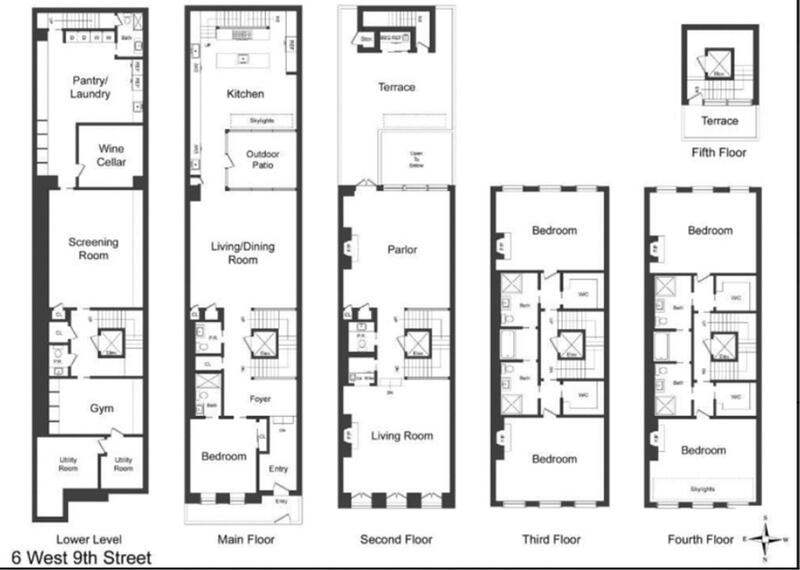 On the 2nd floor sits 2 parlors with modern fireplaces, high coffered ceilings and soft coved lighting. Host guests in the front parlor with a custom wet bar and powder room. Or enjoy movie night down in the lower level's full screening room with a 116" diagonal screen, Panasonic HD projector and Boston Acoustics Digital 7.1 surround sound system. Here you'll also find generous wine storage space, a gym with bathroom, huge staff kitchen with dual LG washers and dryers, dog grooming room with an industrial utility sink, and dumb-waiter that services the entertaining levels. No detail has been overlooked in this home's energy efficiency and cutting edge features, which include: silent thermal mass heating with radiant solid granite floors, filtered air throughout, high velocity A/C with electrostatic filtration delivering cleaner air than outside, silent triple-pane windows, LED lighting, ultra high-speed fiber optic internet service, an ADT Security system with smoke/CO2 sensor loop, and a Savant Home Automation that affords total access to home security surveillance, audio/video, intercom, VOiP telephony and HVAC control, an anti-ice radiant heated sidewalk with auto snow sensor and exterior trash vault with hidden access. This is a rare breed of residence in a prime Village location between Fifth and Sixth Avenues, near Washington Square Park and all that this sought-after neighborhood offers.